Write a C program to read elements in a matrix and check whether the given matrix is symmetric matrix or not. How to check symmetric matrix in C. Logic to check symmetric matrix in C programming. 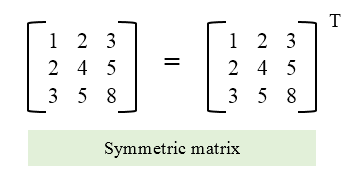 Given matrix is symmetric matrix. To check whether a matrix A is symmetric or not we need to check whether A = AT or not. Below is the step by step descriptive logic to check symmetric matrix. Input elements in matrix A. Find transpose of matrix A, store it in some variable say B. Check if matrix A is equal to its transpose AT then it is symmetric matrix otherwise not. Means check if Aij = ATij (Where 1 ≤ i ≤ m and 1 ≤ j ≤ n) then the matrix is symmetric. * If the given matrix is symmetric. C program to check Sparse matrix. C program to interchange diagonals of a matrix.